The Little House of Concrete Bookshelves: George Pelecanos "The Cut"
A sense of place is a strange creature when you're reading fiction set in a particular location, and with almost all of George Pelecanos' sixteen novels set in the gritty streets of downtown Washington D.C. the reader may or may not feel the need for a map to accompany the narrative as the characters make their way through the setting. I've griped before about the matter of maps in fiction, most recently re. Ian Rankin's Glasgow, noting books with Reading Group Notes at the back accompanied by a map, although it's impossible to locate most of the locations in the story on the map. If you go to the trouble of whacking a map inside the covers you might as well select one that allows the reader to figure out (at least roughly) where we are. 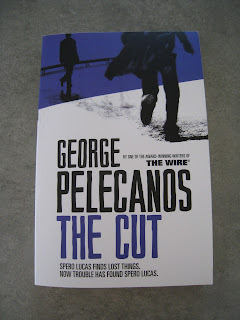 Most of us, for example, aren't overly familiar with the geography of downtown Washington, so you might think some form of cartographic assistance would be appreciated, but Pelecanos has a style that slips over the ground well enough to make one unnecessary. If you wanted to quibble about it, you might end up interpreting the detail thrown into the narrative here as padding (there's certainly enough of it there to raise that suspicion) but it's almost a case of an author who renders the question of an accompanying map immaterial by going to a level where you'd need a small scale street directory if the anorak brigade were going to be able to check these things out. 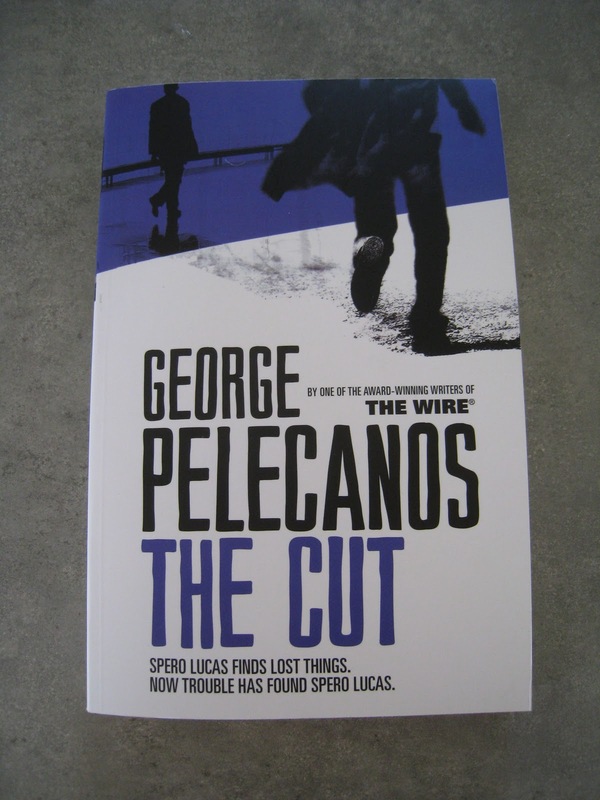 The main issue, as far as I can see, is keeping the reader going, turning the pages and heading towards the conclusion and Pelecanos manages to do that rather well. He's a class act, and I don't recall spending any more than a day or two on any of his previous efforts because I wanted to find out the ending. Which is what it's all about in crime fiction isn't it? I'd actually gone off Mr P's work a while back, largely due to the psycho'd out factor, but this time around there's less focus on the extreme end of the psycho- and sociopath spectrum, though you wouldn't be wanting to run across any of these dudes late at night in a dark alley. Iraq War veteran Spero Lucas has picked up a nice little earner as an unlicensed private investigator, doing the leg work for, among others, a prominent criminal lawyer. On the side he tracks down objects that have gone missing, operating on a 40% commission. The two strands of his career run together when his work on the ground results in a teenage kid getting off a car stealing rap, largely because Spero's photographic investigations of the scene of the arrest calls the accuracy of the eye witness testimony into question. Those photographic investigations are, by the way, carried out using the private investigator's new best friend, the iPhone. As Spero mentions at one point he could have taken a camera, a notebook and a voice recorder but he's got the lot in a device that fits in the palm of his hand. We soon learn the kid's father is a wholesale drug dealer on remand while he waits to go on trial. His operation is running on, managed by his two lieutenants who he apparently trusts implicitly. They're bringing large quantities of marijuana into Washington via FedEx, with deliveries going to unattended addresses where the swift removal of the object in question isn't going to attract attention. His two trusted lieutenants, however, get taken out early in the piece, and while you'd think that would be the end of the matter Spero has turned up enough to be going on with and a text message on the iPhone provides the key to figuring out what should have been a pair of run of the mill and forensic free drugland killings. As a red-blooded twenty-nine-year-old with some catching up to do she's not the only flame in town, though what his adopted mother (he's the white non-Greek adopted son of an Orthodox family that also took in two black kids) would make of his nocturnal activities is best left to the imagination. Spero's also remarkably well acquainted with the quality end of the D.C. dining scene, which definitely helps when you're setting things up for the horizontal mambo and trying to persuade someone to do you a small favour via an anonymous phone call on an untraceable mobile. His brother, who teaches at the all-black high school a block away from the scene of the most recent heist, also slots in as a fairly significant player on the goodies' side, while the other side has a cop who's been inveigled into the heist by his ex-rogue cop father and a couple of heavies who'll take out the opposition with no compunction whatsoever. It's a limited cast, but one that allows Pelecanos to explore issues related to masculinity and the question of whether you take your responsibilities seriously. Spero's brother obviously does, coming across as a dedicated teacher devoted to getting some of his pupils out of the ghetto. Spero might have issues of his own but he's headed (more or less) in the right direction and Anwan Hawkins may be looking down the barrel of a long stretch inside but once he's had the merchandise retrieved (it's a territorial rather than a financial matter) and Spero's collected his commission the rest of the proceeds are going to his ex-missus who's looking after the formerly wayward son. With the dudes on the other side, however, responsibility doesn't enter into the equation. Sure, they deal drugs, kill people and the rest of it, but the notional good guys aren't exactly spotless. The good guys do, however, look after their families, respect their women and maintain a relationship with their kids. Sharp, well-written crime fiction that's a satisfying read and may well parlay into an extended series. You won't be needing a street map.